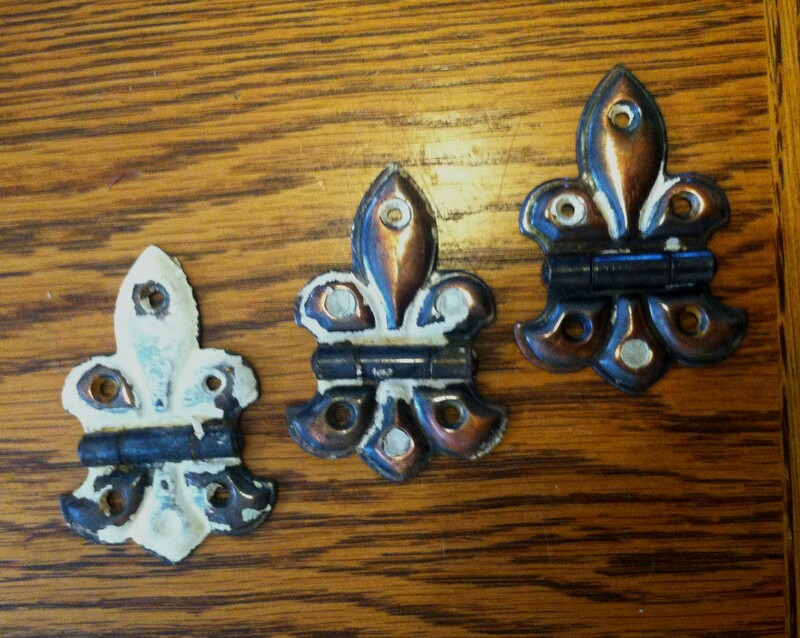 I had purchased these wall sconces a while back at my favorite nearby architectural salvage shop in Ft. Wayne; sconces but no globes. Just down the street from the salvage business is the Habitat For Humanity ReStore, where the same day I found 2 glass globes that fit them perfect. Successful scavenging day! They were pretty dirty, years of hairspray and dust I imagine. I was cautious to try any chemical cleaners on them, so instead I used 0000 steel wool, and lightly polished them to a mirror finish. The left is dirty, on the right is freshly polished. And here it is hanging on the wall to the left of the medicine cabinet opening (no, I haven’t started building the medicine cabinet. I have started designing it though!). 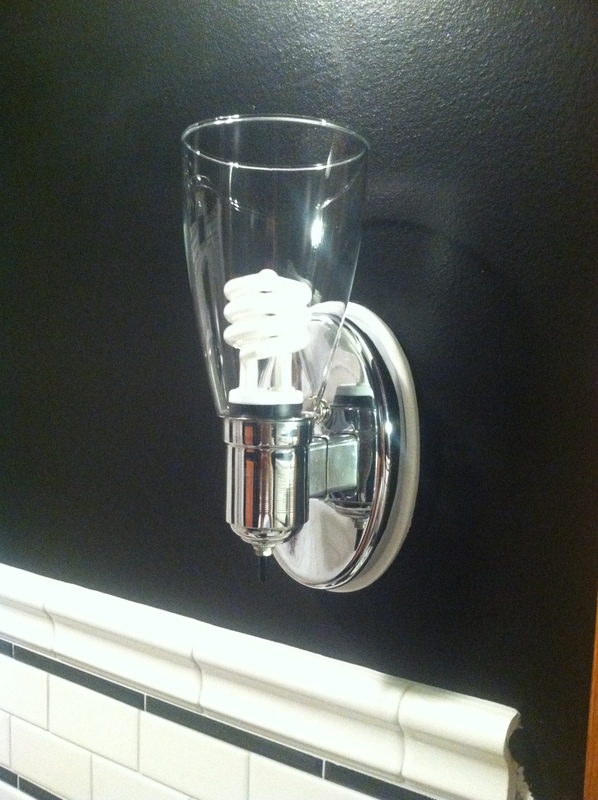 The sconces were just about 3/4 inch narrower than the 4″ round fixture boxes I installed in the walls, which meant I had to fill the space on either side. Although you can buy ready-made fixture box covers that would have worked for a round sconce, these are ellipse and the circular covers wouldn’t look right. So I made my own “medallions” by tracing the sconce onto a 1/4″ thick scrap board, and cut the outline with a handheld jigsaw 1/2″ outside of my pencil tracing. Some rigorous sanding to round over the top edges, and then 2 coats of bright white paint. Of course the wires and wire nuts had to pass through, so I cut a hole in the center of each one before painting. But it was still a trick with only 2 hands to wire the short wires together and tighten the sconce to the wall making sure the white medallion was centered all around. 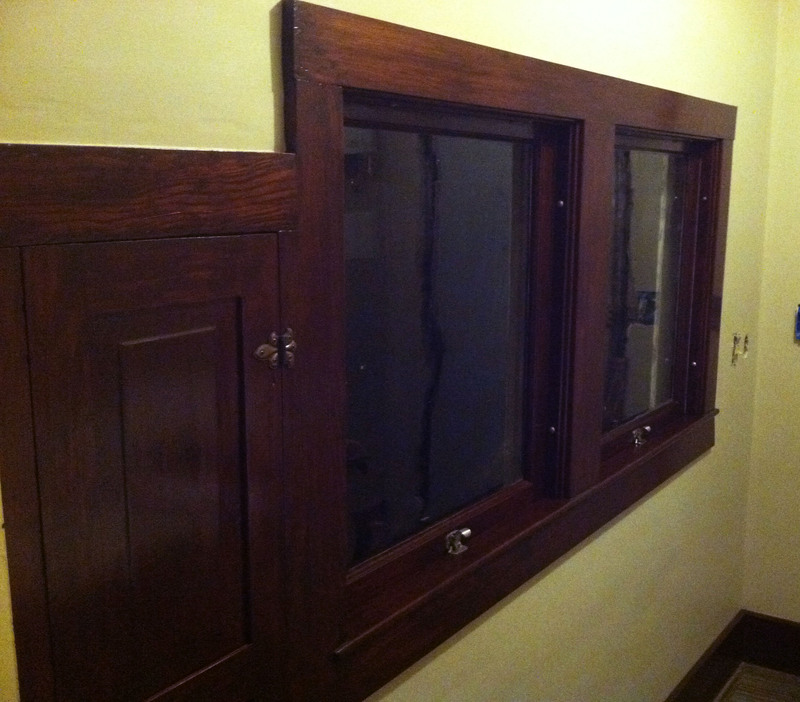 That’s not just woodwork stripped of paint, but 2 windows fully restored, ropes replaced, new lock-pulls, and weatherstripping installed. And if they look good, that’s nothing compared to how smoothly they operate and how tightly they close. I’m working on window 3 (of 10!) and documenting each step for a future post. 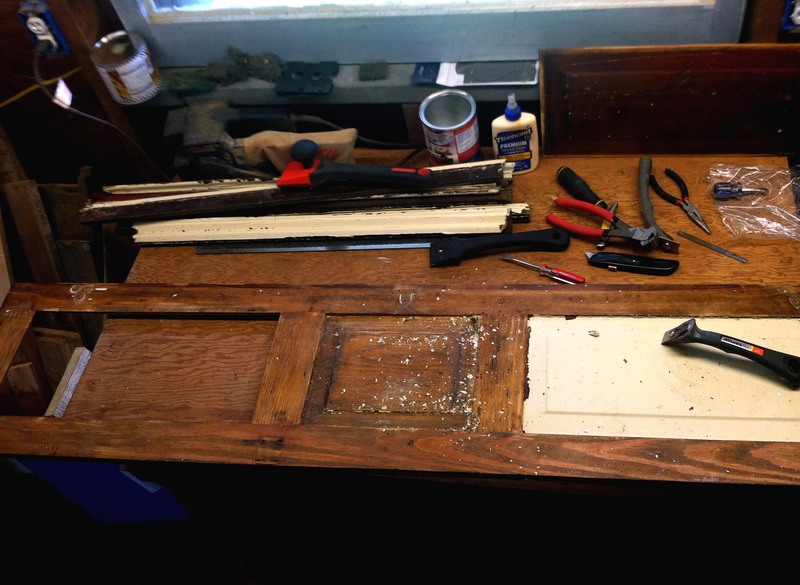 It takes a little longer than tearing out and replacing, but the results are worth the extra effort! That is exactly what my friend said Monday evening when she was over for dinner. 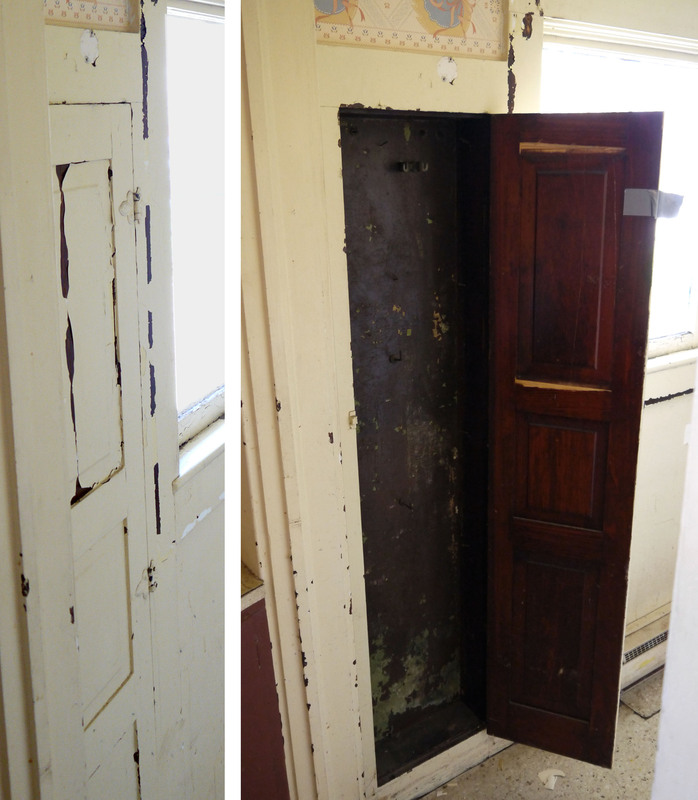 I showed her the finished broom closet door compared to the “before” photo. A quick visit to my local friendly Ace Hardware and I found specialty screws that were a perfect fit & color match for the original hinges, and the door was “swinging again” (It’s like when they say the title of the movie in the movie!) in just 5 minutes. Unfortunately the cabinet door latch was busted – didn’t have a knob at all, and from all the paint it didn’t have it’s spring action either. (In fact, to open this cabinet, someone had folded over a piece of duct tape & stapled it to the edge of the door to make a pull tab. That’s one solution.) 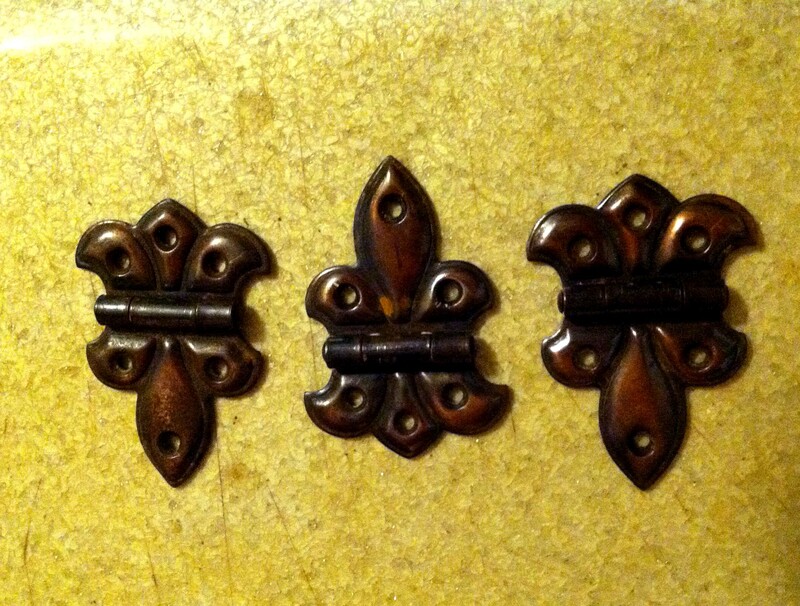 So I’ll keep looking through rummage piles until I find a door latch the same style. For now, the door wants to naturally stay open about 1/2 an inch, so I can use it without a knob. 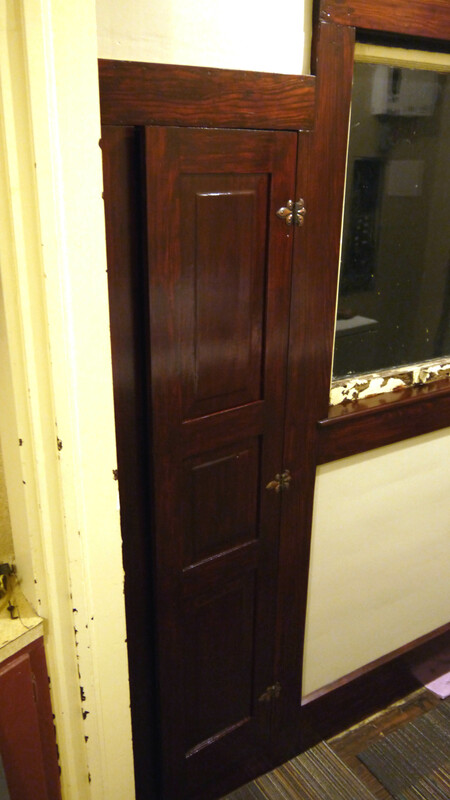 Lastly, I didn’t like how the back wall of the cabinet looked. The paint is chipping, and whatever is under the paint doesn’t even look or feel like wood- it’s almost flexible like thin hard-board paneling. So I bought a sheet of plywood beadboard panel and ripped it down to the exact width to fit inside. Once it was stained & poly’d, it looks like it has always been there. Yes, I lost 3/8 inch in cabinet depth, but there is still plenty of room for a broom, dustpan, and even a small mop handle. On my next run to the hardware store I’ll pick up a couple broom handle clips, a small hook to hold the dustpan, and I’ll be in business. Although I went ahead and stained & poly’d most of the laundry room trim and baseboard, there were some small pieces of baseboard left that were lost – hiding – waiting in the garage. And the built-in broom closet had a busted panel in the door, so I removed it from the hinges and it was waiting in the garage also. Just like the woodwork had 50 layers of paint, so does all the hardware. The hinges are salvagable (although I destroyed the screws trying to scrape the paint off of them to back them out). 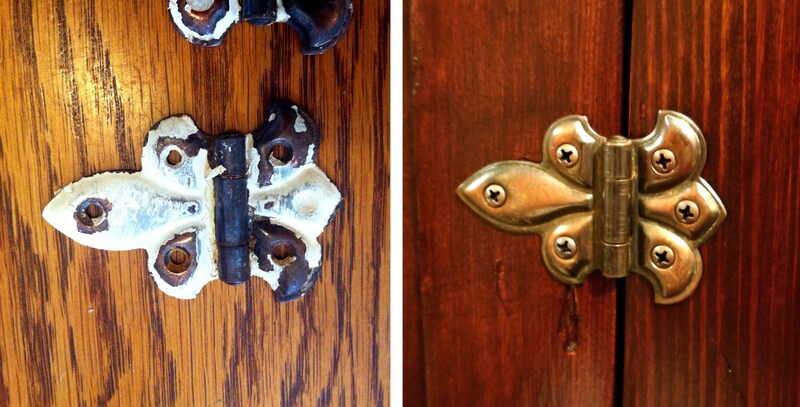 The door latch was busted, but there are other examples in the house so I know what type to look for. I was able to get the busted upper panel out pretty easily – the frame around it on the back of the door was split around the panel, probably when it was broken originally. I carefully scraped the paint off each of the 2 pieces first, I guess I was concerned that once the panel was glued back together there would be paint in the seam that I wouldn’t be able to get out. 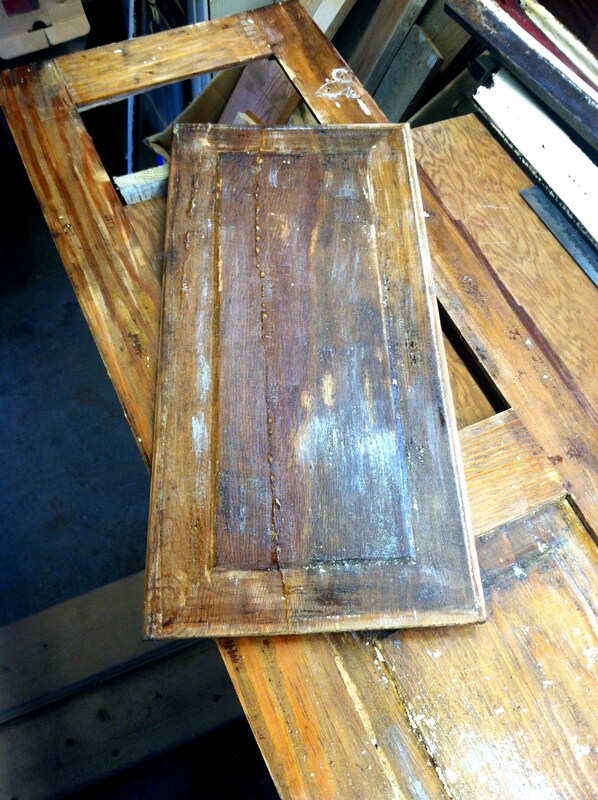 Once scraped, I glued & clamped the broken panel, and went to scraping the door. Scraping flat areas isn’t so bad, and it goes pretty quick. The panels are raised in the center, so a smaller slightly round shaped scraper helps on the recessed outer edges. Lots of paint chips. 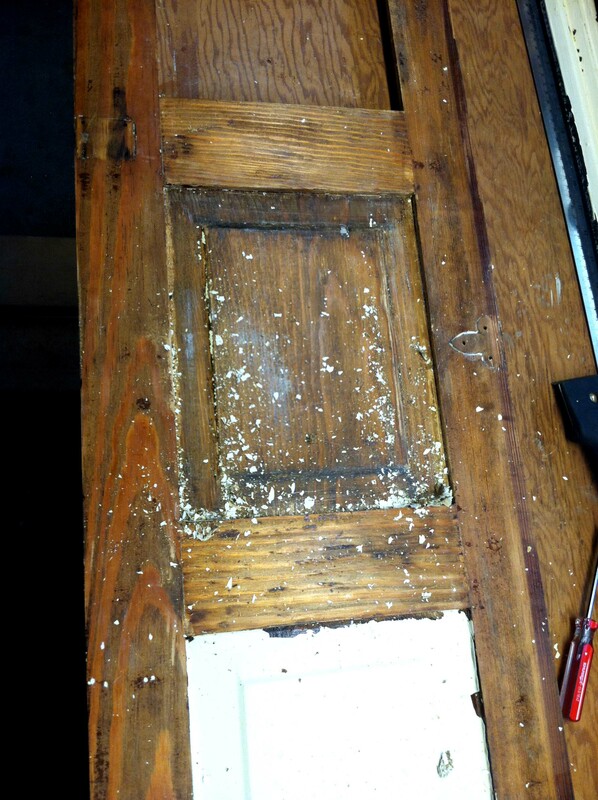 Once the repaired panel was dry, I could remove the clamps and scrape the excess glue off. The hardware was caked with paint. This picture is actually after the first soaking and scrub with a brass bristle brush. 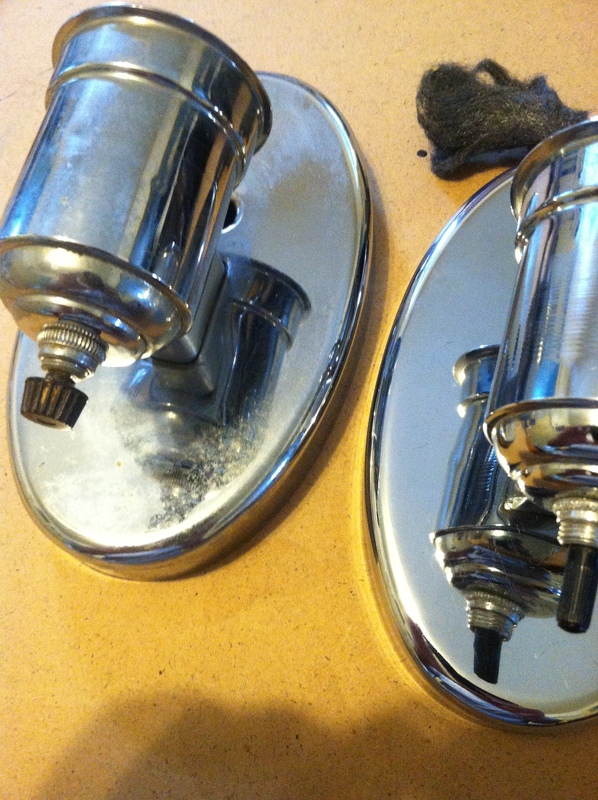 The secret for removing paint off of metal – hinges, knobs, handles – is a good soaking for several hours in very hot water with a touch of baking soda. An old crock pot works really well for this, set it and forget it. The paint on these was so thick, no wonder the door would barely open or close. It took two soakings and a little bit of scrubbing. But they came out perfectly clean. Some new screws and these will be ready for another hundred years of action. 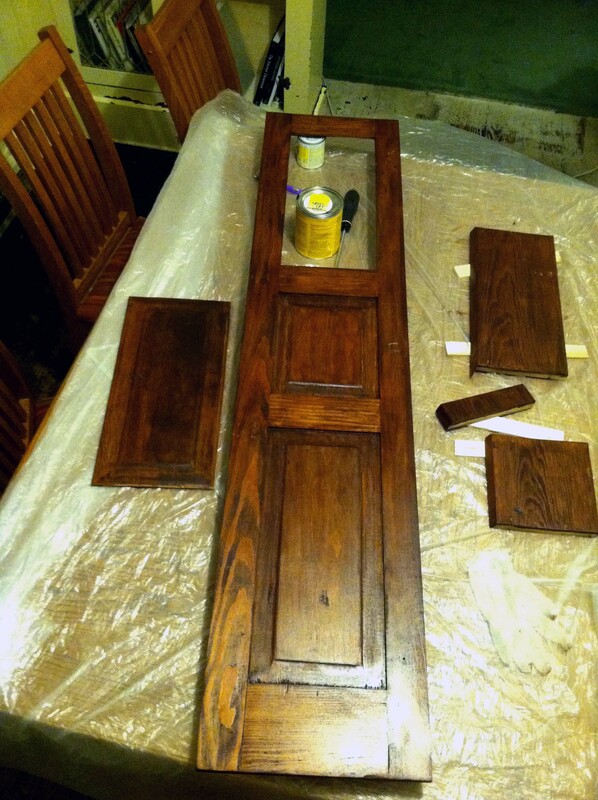 I’ve got the first coat of stain on the door, the panel, and the miscellaneous baseboard pieces. But to achieve the rich mahogany color that was originally under the paint, I have to wait a full day between the 1st and 2nd layers of stain – the stain has to build. If I try to apply the 2nd layer too soon, it simply melts the first layer and I don’t get the rich, full color. I’ll piece the panel back into it’s frame before I brush on the polyurethane, keeping it in place with some thin pieces tacked around it on the back. 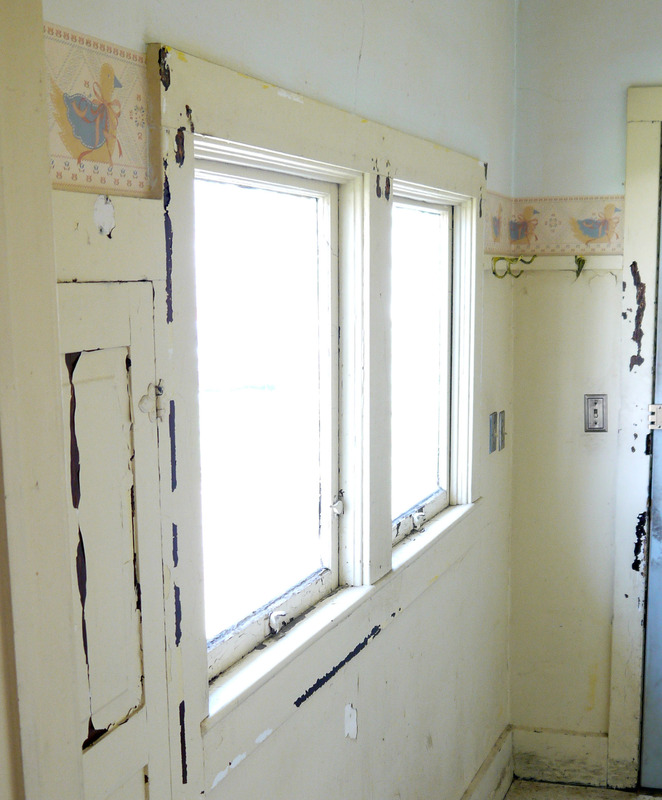 I think something like screen door trim will do the trick. 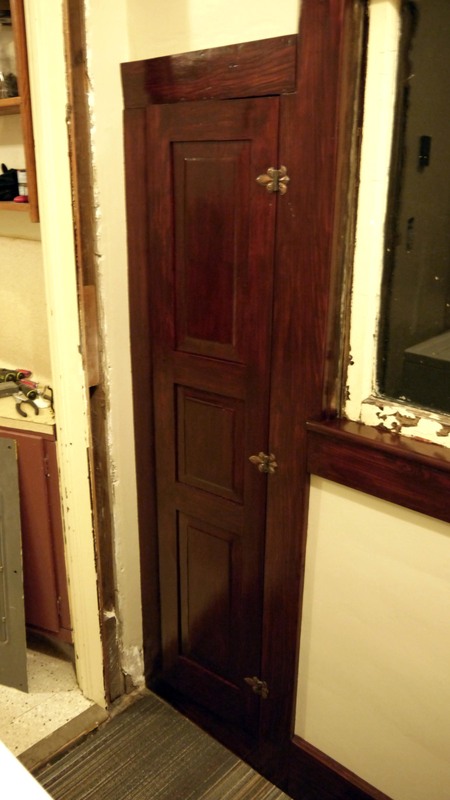 One more layer of stain, and 2 coats of poly – and the door will be back where it belongs. And the laundry will be almost, almost, almost finished.